Priyanka Chopra and Nick Jonas will spend their first Valentine’s Day (14.02.19) as a married couple in London. The ‘Baywatch’ actress has revealed she and the ‘Jealous’ hitmaker – who tied the knot with a three-day wedding in December – weren’t initially going to be able to spend the most romantic day of the year together, due to their hectic working schedules, but she will now be joining her husband in the British capital for a couple of days whilst he’s working there. 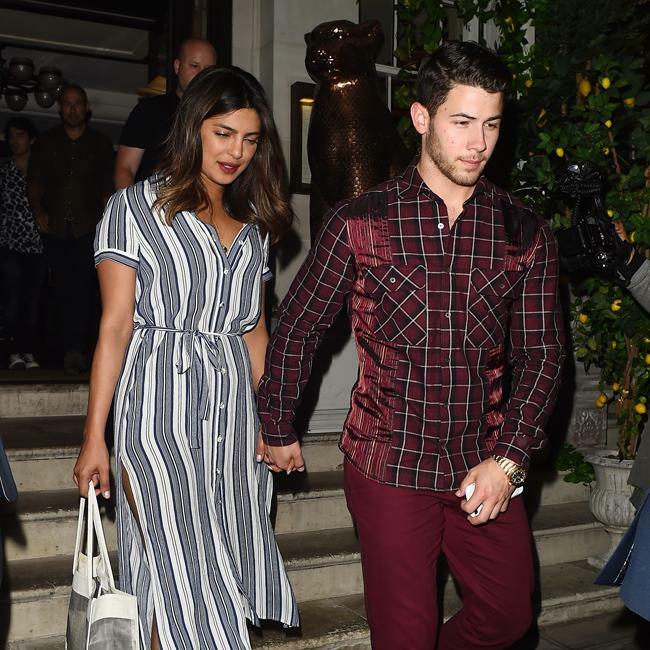 Priyanka told ‘Extra’: "I’m going to be in London, because Nick is going to be working in London so I am going in for two days to hang out." The 36-year-old actress added that she doesn’t believe in having one day to show how much you love someone, and gushed that the 26-year-old singer-and-actor is "thoughtful and sweet all the time". She added: "I’m not a believer that you need a day to tell someone you love them, but it’s always nice to hear it. "We didn’t put too much pressure on it. "We’re not supposed to be together this Valentine’s Day because I was working in LA and he in London, but things moved so I am glad we can spend that time together … The pressure does not exist — he’s thoughtful and sweet all the time." Meanwhile, the ‘Quantico’ star recently revealed she had a "panic attack" moments before she walked down the aisle. Priyanka had a "freak out" when her 75-foot veil was being attached to her. She recalled: "I kind of had a freak out moment right before I was supposed to walk down the aisle. "I remember them putting the veil on me and the veil was like 75-feet, but I had a freak out moment when I was standing behind the curtains. "They were going to tell me when to walk out and the music was going to start playing… I just started having a panic attack." However, as soon as she caught a glimpse of the groom she was put at ease. She added: "Then the doors opened and I saw [Nick] and I cannot forget that moment." She said: "Married life is different. There’s a big difference between a husband and a boyfriend, even a husband and a fiancé. "I didn’t understand the gravity of that when I got married. "But it’s a good thing to be married to a good husband. That makes it easy."